Take one cup wheat flour in a bowl with pinch of salt,oil and water and make soft dough.keep it a side. Take a pan add oil ,Fry onions,salt, turmeric garlic and ginger, green chillies, Add tomatoes. When tomatoes are dry then add minced meat, keep mixing, then add cumin powder,garam masala,coriander powder, chilli powder,garama masala cook till the meet becomes dry, once it is done add coriander leaves. Let the kheema to cools down. Take a portion of dough and place on a lightly floured flat surface and flatten using rolling pin. Place a 2 tbsp of the filling in the center and bring the edges together to seal it well and form a ball. Now using a rolling pin flatten to make a round paratha.Fry paratha with oil on a non-stick tawa until golden brown. Take a pan cook both the sides with butter/ghee/oil. WOw Sarita, am inviting myself to ur place, just love this kheema paratha..yumm! Parathas look goluptious! They are tasty! 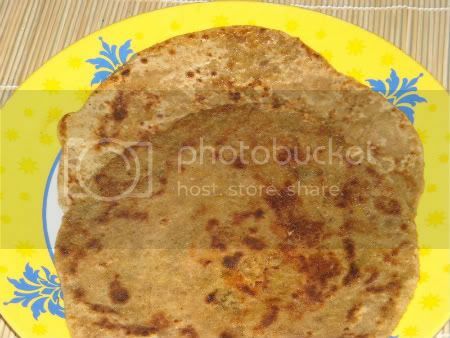 The parathas look perfect...nicely written recipe, thanks for sharing! WOW!!! They looks so lovely. Feel like having some. Never had this kheema paratha, looks so inviting. What meat goes well for stuffing can i use minced chicken?